Pituitary Gland as overall body dysfunction (this is the “Master Gland”) extreme mood changes, problems with menstruation, growth anomalies, etc. Symptoms of Transformation: When the sixth chakra is in the integration process you have difficulty focusing your mind, and you may have a mental disease or be detached and distant from others. You may also become stuck in closed mindedness and intellectual stagnation. You may suffer headaches and fuzzy thinking, as well as sinus problems and vision and hearing problems. Integrated Brow Chakra: When this chakra is integrated with your Soul/SELF your sinuses are clear and your hearing and vision is amplified by your ability to use your innate inner senses to amplify the information gained by your five physical senses. Hence, your intellect and higher dimensional psychic abilities are greatly enhanced, your memory is greatly expanded and your perceptions are acute and accurate. Through your ability to consciously travel into the higher dimensions of your inner reality, your ability to visualize is amplified, your imagination is expanded and you are able to project your visions and imaginations into your outer world. Through this chakra you will initiate your Planetary Consciousness. Eventually, once you have opened your Third Eye, this will be the main center for your higher perceptions, as well as the portal through which you can view your Multidimensional Reality. Symptoms of Transformation: Depression, a feeling of confinement, closed-mindedness, intense worry and anxiety, cerebral tumors, cranial pressure, headaches and migraines, mental disorders, scalp problems, and sleep disorders can result when this chakra is in the process of integration. There can also be a fear of religion or spirituality, frustration and unrealized power, little joy in life, fearfulness of things that cannot be understood with the physical senses, and even schizophrenia. 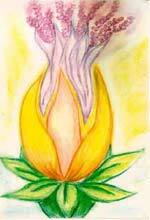 When your Crown Chakra is blocked, a very unpleasant muddy, dark curry color taints the upper portion of your aura. When one is communicating with you, they may experience a tingling and prickling sensation in their crown, as well as an inner warning that psychic protection is needed. When two people communicate whose crown chakras are both unclear, many misconceptions and misunderstandings are common. Their exchange may become adversarial with no evident means of understanding or effective communication. Integrated Crown Chakra: When this chakra has been integrated with your Soul/SELF, you experience a sense of well-being, unity with all life, open mindedness and total faith in your inner directives. Your relationships with others change as well, for when two people with clear crown chakras mix their energies, a soft golden light fills the auras of both people as they experience a deep sense of unity and communion. The three upper chakras of both people merge as Wisdom is transferred, Soul to Soul, across the Rainbow Bridge. This mutual communication is transmitted in an empathic, telepathic manner to be understood in the Throat and Heart Chakras. Once the Third Eye is opened, the Crown Chakra is the Portal through which you will regain your Galactic Consciousness and your ability to merge and communicate with other aspects of your Multidimensional SELF. The “new” extremely high and low brainwaves are initiated by this chakra, as it is the center for your holographic thinking and communication. These new states of consciousness allow you to receive and accept Cosmic Love and the All-Knowing. The ALL-KNOWING re-awakens your ability to perceive the patterns of cause and effect, as well, and the light matrixes that create the illusions of your holographic physical reality. You will also gain access to the formerly unused portion of your brain and activate the 90% of your dormant DNA through the integrated Crown Chakra component of your opened Third Eye. The joining of the pituitary and pineal gland not only facilitates the opening of your Third Eye, but it also assists in activating your Whole Brain Thinking. The Sixth Chakra is often known as the Third Eye. However, according to the postulates of Yoga (specifically those written by H. H. Mahatapaswi Shri Kumarswamiji), the Pituitary Gland of the Sixth Chakra and the Pineal Gland of the Seventh Chakra must join their Essence in the Sacred Triangle to open the Third Eye. The pituitary gland, associated with the Sixth Chakra, is about the size of a pea and is located behind the center of your forehead, between your eyes. Therefore, the sixth chakra is often called the Brow Chakra. The pituitary gland is known as the master gland, because it acts as a main control center that sends messages to all the other glands from its two lobes, the posterior and the anterior. This gland prompts the proper growth of other glands and organs and regulates sexual development. The pituitary gland is called the “seat of the mind,” with the frontal lobe regulating emotional thoughts such as poetry and music and the anterior lobe regulating concrete thought and intellectual concepts. On the other hand, the pineal gland is known as the “seat of illumination, intuition and cosmic consciousness.” The pineal gland is to the pituitary gland what intuition is to reason. The pineal gland, associated with the Seventh Chakra, is cone shaped, also the size of a pea, and is located in the middle of the brain. The pineal gland contains pigment similar to those found in the eyes and is connected to the optic thalami. Hence, the pineal gland controls the action of light upon your body. The pineal gland is located in the posterior end “roof” of the third ventricle, which is the Sacred Triangle, and the pituitary gland is located in the anterior “peak” of the third ventricle, towards in the inside of the forehead. The joining of the essences of these two glands opens the Third Eye. 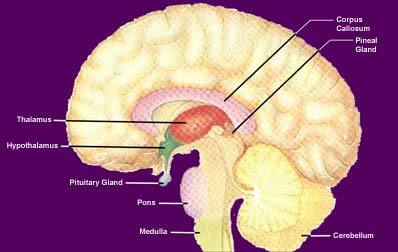 The pineal gland acts in two ways to inhibit the action of the pituitary gland. First, the pituitary gland is responsible for activating adolescence and the beginning of sexuality, and the pineal gland checks the pituitary gland to prevent premature sexual awakening. Second, human thought is regarded as a result of suspended action, and the pineal gland inhibits the immediate discharging of thoughts into action. This inhibition causes you to look inward and to deeply ponder your actions and reactions. Introversion is vital for self-realization as it displaces your attention from the outer world to the inner. When the external world disappears, your circle of consciousness contracts, and your primary attention focuses upon your inner self. 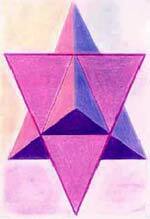 It is this inner attention that magnetizes “spiritual light” into the pineal gland. The third ventricle of the brain is a narrow opening lying near the base of the cerebral hemispheres and separating the two thalamic areas. These thalamic areas are the brain’s “storehouse” of all your sensory perceptions. When the pituitary and pineal glands are fully developed and stimulated through meditation upon the Sixth and Seventh Chakras, their vibrations fuse and activate the Third Eye. Once the Third Eye is open you have personal access to higher knowledge. Shiva yoga is a form of yoga practice which concentrates on awakening the pineal gland. This gland is often dormant, as your third dimensional self is usually focused on the outer sensate world rather than the higher spheres. Shiva yoga teaches that Cosmic Light descends to meet the individual through the optic thalamic nerve connection of the Crown Chakra. Once Kundalini has risen to the Pituitary Gland, it merges via the third ventricle with the Cosmic Light that the Pineal Gland has received. The human brain has a fundamental resemblance to a human, androgynous embryo. The Pituitary Gland holds the positive, masculine charge and the Pineal Gland holds the negative, feminine charge. When the masculine and feminine energies meet in the brain it is known as the Mystical Marriage. The Mystical Marriage initiates the birth of your multidimensional consciousness and the expansion of your consciousness into the fifth dimension and beyond. The rising Kundalini pulls the energy up from Mother Earth through the nerve channels, into the medulla oblongata, through the pons area of the brain and then down into the Pituitary Gland behind the eyes. The increasing Pituitary radiations then pass through the third ventricle to awaken the Pineal Gland which has received the Cosmic Light from the higher dimensions. The feminine, earth energy merges with the masculine Pituitary Gland, and the feminine Pineal Gland receives the masculine Higher Light from Spirit. When the two awakened chakras’ essences meet in the third ventricle, there is the union and harmony of “Spirit into Matter” as the multidimensional forces of spiritual, higher dimensional Light merge with the matter of our third dimensional brain. It is then that the polarities of masculine and feminine are merged into ONENESS and your Whole Brain Thinking is initiated. The opened Third Eye is also known as the Middle Eye of Shiva, the Eye of Horus, and the Horn of the Unicorn. The Temple of Maat in early Egypt was dedicated to the process of opening the Third Eye. The Third Eye is an etheric, higher dimensional eye, which acts as a sensitive receiver, and transmitter, by which higher dimensional perceptions can be translated, interpreted and dispersed into your third dimensional brain to gain wisdom and illumination. 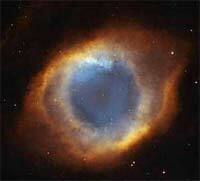 Through this EYE, Beings and realities of the fifth dimension and beyond can be perceived and understood. This information changes your thought process, your emotionality, and your sense of cause and effect, as well as your entire attitude about the concept of “life.” All eyes, including the Third Eye, need a lens to give meaning to a perceived light sensation. The Third Eye’s lens is located in your aura, just in front of your Sixth Chakra. The psychic construction of this lens is part of the discipline that leads to the accurate perception with our inner eye. By using this point in your aura (between your eyes and in the center of your forehead) as a focal point during meditation, you can facilitate the development of your Third Eye’s lens. Using this form of meditation also facilitates Theta Brainwave Consciousness and beyond. You have seen from the perspective of a human, how Cosmic Light merges SPIRIT into MATTER. How would you perceive this process if you were a Photon of Light?